I love a book with a good title. I love good titles in general. When I’m bored, I sit around writing titles, placing each one in its own Word file so when I feel like writing but want to work on something new, I just need to look at all those empty, waiting documents, pick the one with the title that intrigues me the most, and start writing. 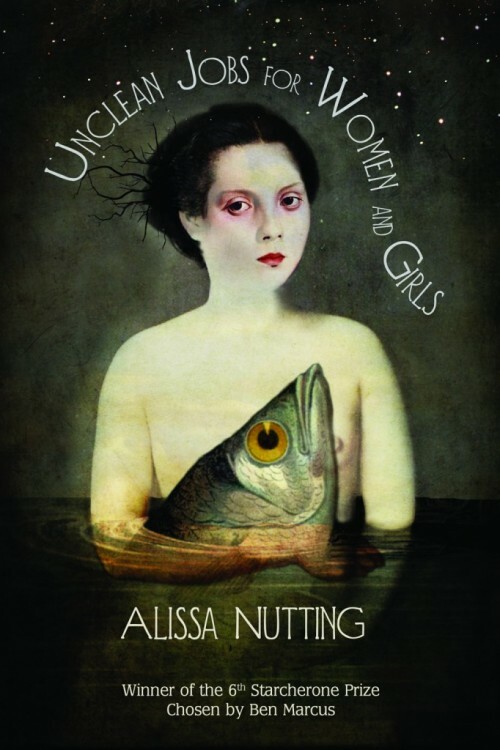 Ever since I first heard of Unclean Jobs for Women and Girls by Alissa Nutting (Starcherone Books), I have been charmed by the title and I finally had the chance to really sit down with the book. I ended up reading it one sitting because it was one of those books you literally cannot put down. The stories in this collection are smart and imaginative and strange and fearless in their execution. It is readily evident why this book won the Starcherone Prize for Innovative Fiction. A great deal of care and handling went into these stories. In Contemporary American Novelists of the Absurd, Charles Harris writes, “The absurdist vision may be defined as the belief that we are trapped in a meaningless universe and that neither God nor man, theology nor philosophy, can make sense of the human condition.” As I’ve read about Unclean Jobs for Women and Girls over the past couple months, I’ve often seen references to the writing as absurdist fiction. I would disagree. While many of the stories have a surreal, almost absurd quality to them, the stories by no means imply that they are a response to a belief that we are trapped in a meaningless universe because so many of the characters in these stories are clinging to the hope that there is, indeed, some meaning in the universe. In each of these stories, Nutting is, above all making beautiful sense of the human condition. Sarah Falkner wins the 7th Starcherone Prize for her novel Animal Sanctuary, selected by Stacey Levine. It sounds quite look-forward-to. Last year’s winner, Unclean Jobs for Women and Girls by our own radical Alissa Nutting, selected by Ben Marcus, is coming out October 1st! It’s going to eat your hair. You can preorder it now from Starcherone or wherever great books are. Here’s a taste, from Fence. 4. Forte Magazine is wtf. Please help us welcome two new fantastic GIANTs to the fold: Evelyn Hampton, editor of Dewclaw and author of We Were Eternal and Gigantic forthcoming from Magic Helicopter Press, and Alissa Nutting, author of Unclean Jobs for Women and Girls, forthcoming from Starcherone Books. Put on your party hats!